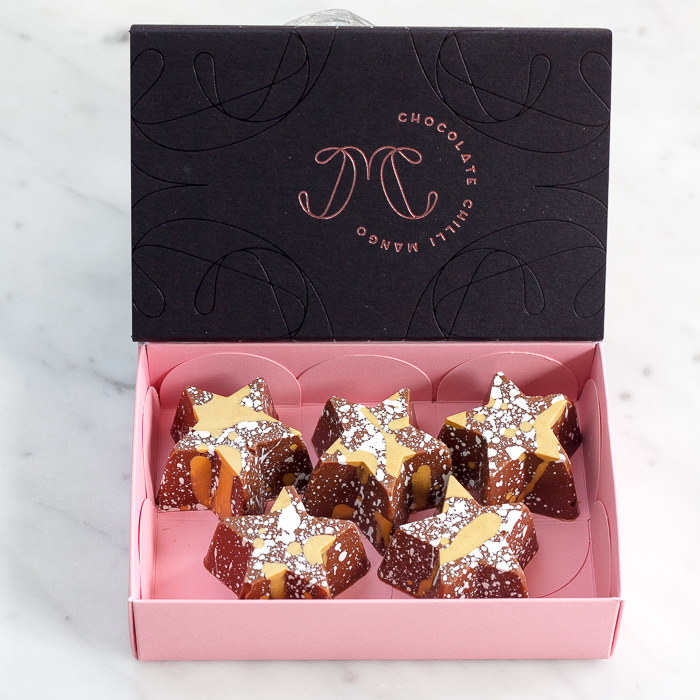 5 Pce Popcorn Praline Stars Gift Box - SALE! 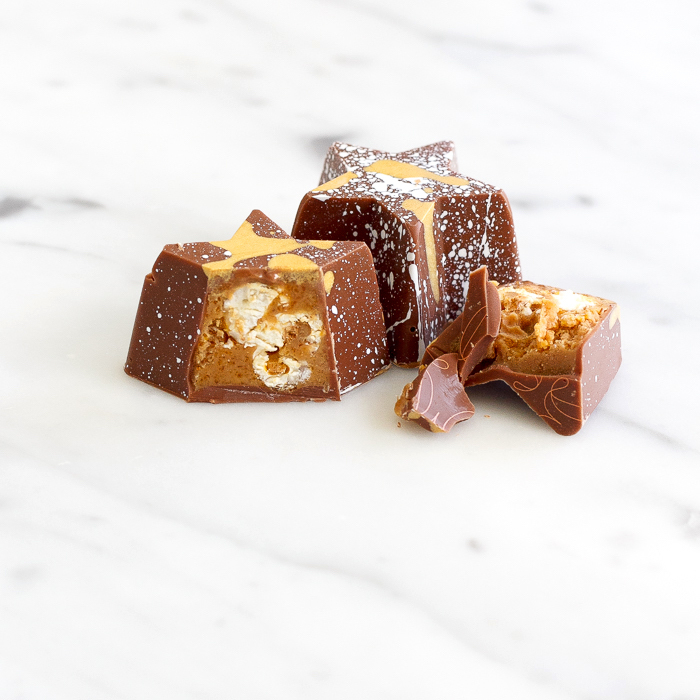 Crunchy caramelised popcorn over a smooth hazelnut and caramelised 32% white chocolate praline. 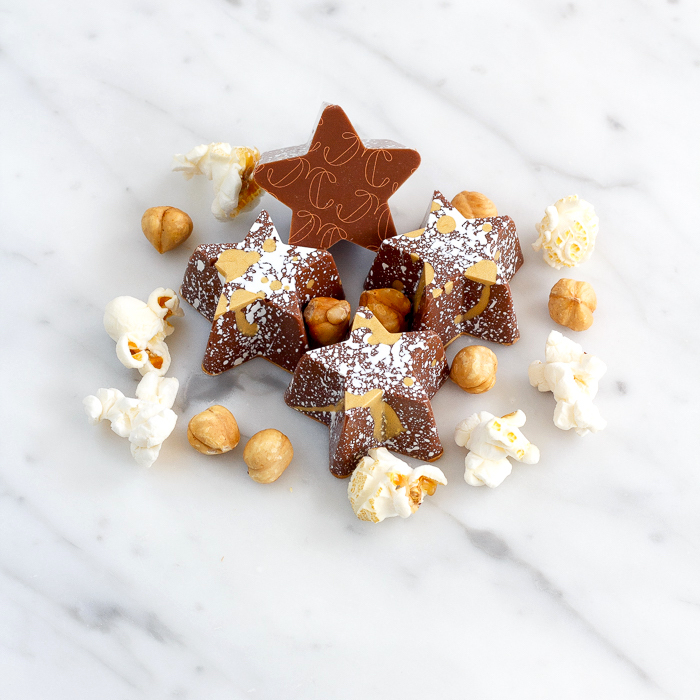 Made with our own housemade hazelnut praline, these stars are true bites of heaven. Beautifully gift boxed for Christmas. Contains 5 x 20g stars. Ingredients: sugar, cocoa butter, cocoa beans, whole milk powder, hazelnuts, dried skimmed milk, whey, butter, popcorn, emulsifier (soya lecithin), natural vanilla extract, sea salt, coloured cocoa butter. Allergy information: contains milk and soy. May contain traces of other nuts, egg proteins, and gluten. Store in a cool, dry place, between 16°C-18°C. Within the Melbourne Metro area, pick up or delivery options are available for all chocolate orders. Please ensure someone is at the delivery address to receive your package. Chocolate is a fragile item and should not be allowed to sit out in the elements. Postal delivery of chocolate products is via the Australia Post Express Post service for overnight delivery within the Express Post network. Please allow 2-3 days for delivery outside the EP network in Australia. Please check the Australia Post website to verify if your location is within the network. A tracking number for deliveries via Express Post will be emailed to you when your order is dispatched.